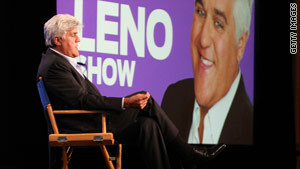 NBC executives decided this month to cancel "The Jay Leno Show" after just four months, amid low ratings. Leno: NBC will likely announce Tuesday his return as host of "The Tonight Show"
Host suggests to network: "How valuable can I be? You fired me twice"
Los Angeles, California (CNN) -- Jay Leno expects NBC to announce Tuesday that he will return to hosting "The Tonight Show," a job he handed off to Conan O'Brien last summer, the comedian said Monday night. "It looks like we might be back at 11:30," Leno told the audience of his 10 p.m. show. "I'm not sure." NBC executives decided this month to cancel "The Jay Leno Show" after just four months, amid low ratings and pressure from local affiliates. With O'Brien's "Tonight Show" ratings also lagging, the network initially asked Leno to host a half-hour show that would start at 11:30 p.m., he said. "I said, 'OK, I'm not crazy about doing a half-hour, but OK. What do you want to do with Conan?'" Leno said. NBC told him O'Brien would remain on "The Tonight Show" for a full hour starting at midnight, Leno said. "I said, 'OK, you think Conan will go for that?" Leno said. "Yes, yes. Almost guarantee you." Leno said he later read in a newspaper that O'Brien would not agree to being pushed back to midnight. He then agreed with NBC to return to the "Tonight Show" if O'Brien decided to leave, Leno said. "This way, we keep our people working, fine," Leno said, speaking of those who work on his show. Leno called O'Brien "a good guy" and said he has no animosity toward him. "This is all business," Leno said. "If you don't get the ratings, they take you off the air." O'Brien took over as host of "Late Night" in 1993, after David Letterman left to start a show on CBS. NBC, fearing they would lose O'Brien to another network, agreed in 2004 to name him as Leno's replacement five years down the road. "I'm sitting in my office, an NBC executive comes in and says to me, 'Listen, Conan O'Brien has gotten offers from other networks. We don't want him to go, so we're going to give him 'The Tonight Show.' I said, 'Well, I've been No. 1 for 12 years.' They said, 'We know that, but we don't think you can sustain that.' I said, 'OK. How about until I fall to No. 2, then you fire me?' 'No, we made this decision.' I said, 'That's fine.'" Leno said his plan was to retire last year, but NBC said it wanted to keep him at the network. When NBC executives suggested he host a 10 o'clock show it "didn't seem like a good idea at the time," Leno said. "I said, 'That will never work.'" "'We have done focus groups,'" Leno said they told him. "'People will love you at 10. Look at these studies showing Jay's chin at 10. People will go crazy.'" iReporter: NBC "messed up in a major way"
Leno said he agreed to the move after NBC said it would guarantee him two years on the air, because it would take time to establish prime-time viewership. "Four months go by, we don't make it," he said. When he asked to be released from his contract, NBC told him he was "still a valuable asset to this company." "How valuable can I be? You fired me twice," Leno said. CNN's Jennifer Wolfe contributed to this report.